Countless galaxies, unfathomable distances, exploding stars, diamond planets, black holes, there’s no way around it. 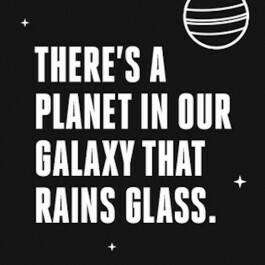 Space is mind-blowingly, fantastically awesome. 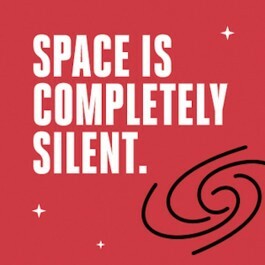 In short, you could say…Space is Freaking Awesome. 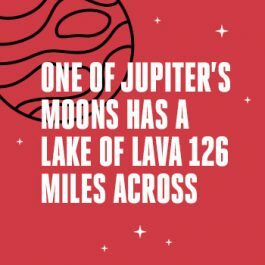 Explore more mind-boggling facts about our Universe below. Or, better yet, come on by; there are a lot more where these came from. 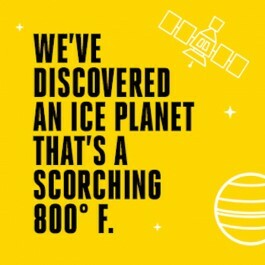 Heat shields protect astronauts from the blistering heat generated when their spacecraft re-enters Earth’s atmosphere from space. 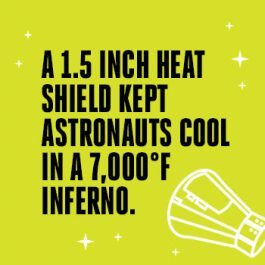 An ablative heat shield, like the one used on the Gemini 12 craft, is a very thin layer of material designed to burn up in the atmosphere and take all that heat energy with it—away from the spacecraft. This lake of fire is called Loki Patera, and it’s located on Jupiter’s nearest moon, Io. Although the average surface temperature of Io is a frosty -261 degrees Fahrenheit, Loki Patera stays molten because of “tidal friction heating.” Gravity from Jupiter and Europa (the next-closest moon) tug at Io from different directions, causing Io to flex and producing the friction—and heat—that keep Loki Patera bubbling. Cloud Gate (aka “The Bean,” the smooth reflective sculpture in Millennium Park) is made of stainless steel, which has a melting point of 2,750 degrees Fahrenheit. 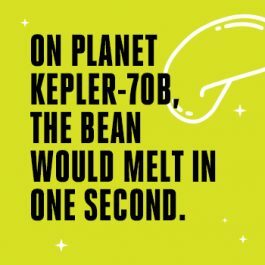 Kepler-70b’s surface temperature is 12,398 degrees Fahrenheit—more than hot enough to melt The Bean! And because The Bean is only 3/8 of an inch thick, it would melt very, very fast. 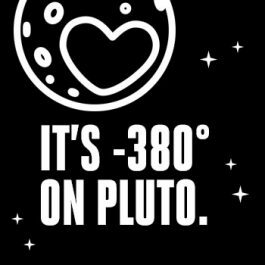 The surface of our Solar System’s most popular dwarf planet, Pluto, makes Chicago winter look like a tropical vacation. Across Pluto’s mountains and plains, ices made of nitrogen, methane, and carbon dioxide were spotted by NASA’s New Horizons mission, which also found evidence that Pluto’s atmosphere is more complex than we thought. White dwarfs are the dead skeletons of stars that started life like the Sun. 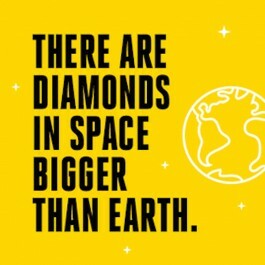 When a Sun-like star dies, it collapses to something about the size of Earth, which is almost completely crystallized carbon—what you and I call “diamond” on Earth. Anything less dense than water will float in water. 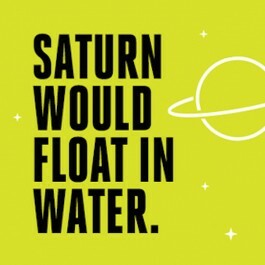 Saturn’s density is about 70% that of water. Finding a bathtub big enough may be a problem. 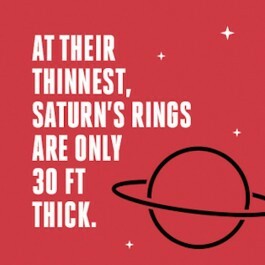 Saturn’s rings can be up to tens of kilometers thick, but 30 feet thick is the standard number NASA reports. It is one of the reasons that when Saturn reaches certain parts in its orbit and we’re looking at the rings edge on, they’re not visible—they’re just too thin to see! 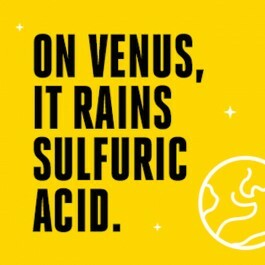 The clouds on Venus are definitely sulfuric acid, which does rain out. However it is so hot on the planet, the droplets evaporate well before they reach the surface; there is no rain on the surface of Venus. Nuclear fusion in the Sun smashes hydrogen atoms together to make helium, releasing energy at the same time. We see that energy as light. But things are densely packed in the core of the Sun. The light tries to fly out, but hits atoms and gets bounced in random directions—kind of like you trying to get through a crowded room at a party. Slowly through this random bouncing, the light makes it to the surface—this takes about 175,000 years! 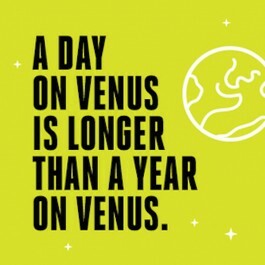 One year (time around the Sun) on Venus is 224.7 Earth days. One day (time to spin on axis) on Venus is 243 Earth days. 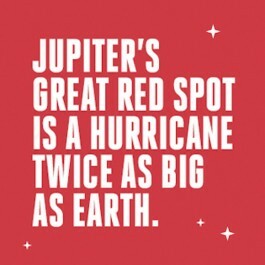 We don’t know how long the Great Red Spot has been on Jupiter. 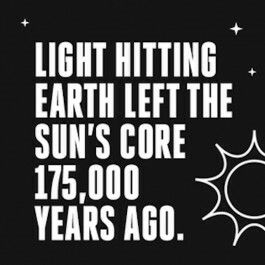 It was discovered by Cassini in 1665, so it’s at least 400 years old, but likely much older. The boundaries are indistinct, and it changes size over time, but astronomers typically describe it as 2-3 times the size of the Earth. On Gliese 436b the gravity is so strong, it compresses water molecules together so tightly they form a crystalline structure—ice! When you squeeze things together, the temperature goes up, but because you are also squeezing the molecules together they can’t roll around freely like a liquid—so you have hot ice! Olympus Mons is 25 km—82,000 feet—high. 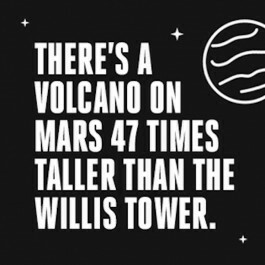 At its tip, Willis Tower is 1729 feet, so dividing these makes Olympus Mons 47 times higher than Willis.